As the year comes to a close, I’ve been reflecting on my work as chair of the 2015 RVA Active Aging Week. I participated in several different activities region wide and met some very interesting people during Active Aging week this past fall. Walking and dancing were not new activities to me, but working with Project:HOMES to install a wheelchair ramp was a totally new adventure that I want to bring with me into the new year. If you didn’t get active during this week, it is never too late to get started. With New Year’s right around the corner, it is the time for New Year’s resolutions. The most common New Year’s resolution is to be more active. Therefore, it is the perfect time to kick start your adventure! Your body, mind and spirit will love you for it. Research has shown that there are many benefits for older adults who have initiated a regular program of exercise into their lifestyle. These benefits include improved cardiovascular health, improved muscle function, flexibility and strength and improved cognitive functions. Exercise can improve your mood and your overall outlook on life. Even people with chronic illnesses can benefit from safe physical exercise. I am so thankful for the things I can do, as a result of keeping active. I am still working on “Living My Adventure.” I’m planning to attend a Dance-a- thon and a Body Flow class in the next couple of weeks! How will you continue your adventure in 2016? Need some inspiration to get your adventure started? 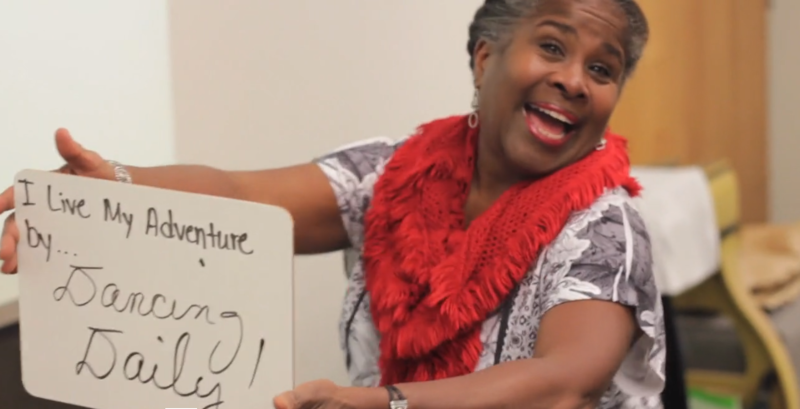 Check out this year’s Active Aging Week video! The planning for 2016 Active Aging Week has already begun. Keep up with the latest news by “liking” our Facebook page at Facebook.com/RVAActiveAgingWeek. We look forward to hearing your resolutions for a Healthy 2016!